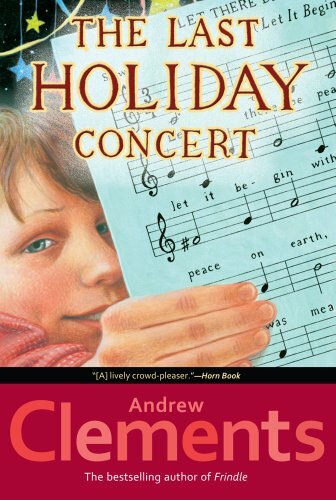 Hart Evans, the most popular kid in the fifth grade, has to find a way to save the job of school choir director Mr. Meinert from budget cuts, in a moving holiday story from the author of Frindle. Reprint. Amazon.com description: Product Description: For Hart Evans, being the most popular kid in sixth grade has its advantages. Kids look up to him, and all the teachers let him get away with anything -- all the teachers except the chorus director, Mr. Meinert. When Hart's errant rubber band hits Mr. Meinert on the neck during chorus practice, it's the last straw for the chorus director, who's just learned he's about to lose his job due to budget cuts. So he tells the class they can produce the big holiday concert on their own. Or not. It's all up to them. And who gets elected to run the show? The popular Mr. Hart Evans. Hart soon discovers there's a big difference between popularity and leadership, and to his surprise, discovers something else as well -- it's really important to him that this be the best holiday concert ever, and even more important, that it not be the last. About: Life is usually easy for popular fifth grader Hart Evans, but when his music teacher puts him in charge of the holiday concert, Hart must use all of his leadership skills to unite the other students. About: For Hart Evans, being the most popular kid in sixth grade has its advantages.